Check out my article on BOLD’s website! The recent firestorm involving Roseanne Barr and her racist tweet suggesting that President Barack Obama’s former Senior Advisor Valerie Jarrett was an ape has prompted me to discuss, again, the notion of intentionality and racial offenders — just as I did a few years ago in my book “It’s Not Always Racist…but Sometimes It Is: Reshaping How We Think About Racism” (2014, Archway Publishing). Because of my intention to promote peace and to help the public understand the difference between racial bias and racism, there, I emphatically argued that not all racial offenders should be lumped into the same category as “racist.” Instead, I argued that it was important to consider the person who said it and the context and circumstances in which the incident occurred. I also emphasized considering the history of the person before making the decision to condemn them to racial offender hell. “I am simply proposing that we look at the motivations and intentions of racial offenders, just as it is done in the law. For example, in criminal law, when one person takes the life of another, the motivations and intentions of the perpetrator are considered while lawyers try to determine the types of charge(s) to be laid (e.g., manslaughter, murder 1, and murder 2). That individual then becomes eligible to receive a punishment that directly corresponds with the specific charge(s) laid. Why is this done in law? Because not all crimes are alike, and likewise, not all incidents related to race are alike. We must consider the intent of individuals who make mistakes related to race instead of saying everything is racist and, consequently, severely punishing the culprits without completely understanding what happened” (p. 29-30). Her message was very clear and with no opportunity for misinterpretation. 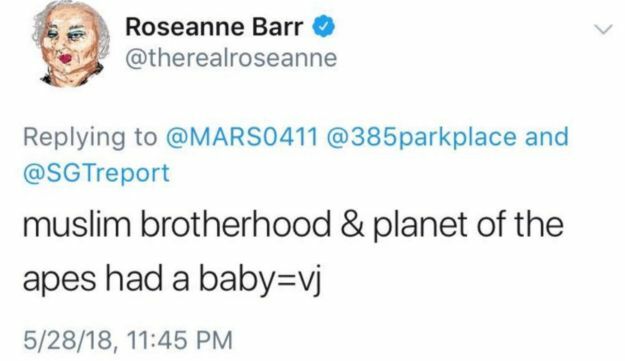 Quite frankly, as a black woman, her comment was grossly offensive because in essence, Roseanne Barr invoked and spewed an old and hurtful stereotype that likens black people to monkeys and apes. So her recent tweet, coupled with her history that includes other racist and anti-Semitic behaviors, are collectively tantamount to professional suicide, and thus, the public will probably never have an appetite for her “humor” again. Relatedly, I hope the public will also send a clear message to the eight white nationalists currently running for office in the United States that their brand of politics, “patriotism” and humanism are not welcome. I am equally appalled and offended by the recent words of Holocaust denier and blatant racist, Arthur Jones, who in a recent television interview with a biracial woman said that black people were not smart. When the interviewer informed him that she was biracial and Harvard-educated, he concluded that it was her “white” side that was the intelligent side responsible for her achievements. As a diversity educator and consultant for many years, it has always been the case that people will withhold their negative feelings about race because it is not socially acceptable or appropriate. But of late, there has been a rise in openly blatant rhetoric like that of Arthur Jones that should never be normalized or even considered appropriate by any person, let alone someone running for office in the United States government. We all need to forget about race, gender, party affiliation and all other factors, and focus only on who is on what side of the line of decency and humanity. As I have said, not all racial offenders are alike, and not all incidents related to race are alike. But it is clear by the rhetoric of Arthur Jones that if he successfully wins his political race, his deeds will mirror his beliefs and words and this would not bode well, especially for black and Jewish people. We need to make sure that people who have bad intentions are not elected and given a platform to destroy our principles of diversity, inclusion and basic decency.